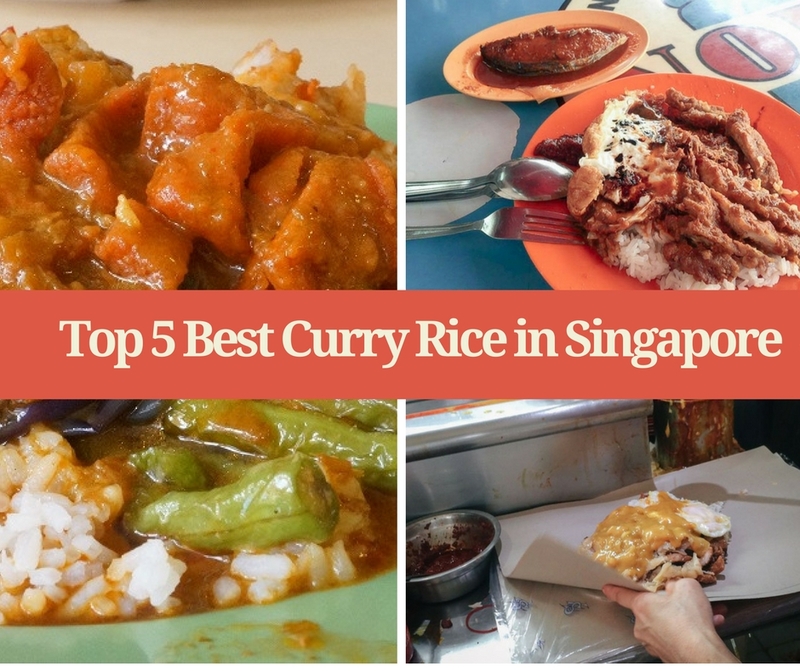 What is Hainanese Curry Rice? Hainanese curry rice is a Chinese Singaporean dish consisting of steamed white rice smothered in a mess of curries and gravy. Characteristically accompanied by curry chicken, pork chop, chap chye (braised cabbage) and kong bak (braised pork). it originates from Singaporean cuisine and is not often thought of as part of the cuisine of Hainan, China. Hainanese curry rice developed during British colonial rule in Singapore. It was started by Hainanese living in Singapore, who were often employed by the British as well as the wealthy Peranakans (Straits-Chinese) as chefs in their homes. Pork chop was adapted from British cuisine and the rest of the ingredients, such as curry chicken, babi pongteh and chap chye, were from Peranakan cuisine. These were adapted for Hainanese curry rice. At that moment, it was an instantly recognized dish. All the dishes were sumptuously cooked; the taste of traditional Hainanese curry rice was unreservedly showcased in all the dishes. 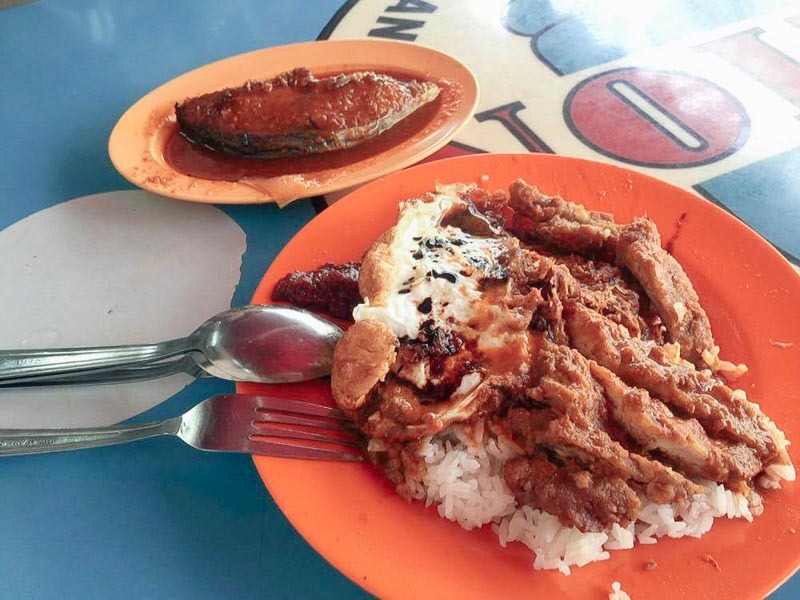 From the simple fried cabbage to the crispy fried fish, there was an unmistakeable nostalgic flavour that truly lives up to the name of the stall. The dishes by Long Xiang Hainanese Curry Rice were very well cooked and tasty. Everything from the eggplant, cabbage, shark meat with salted vegetable, egg omelette to the pork chop were simply sumptuous; the dishes definitely deserve the top rating in our opinion. 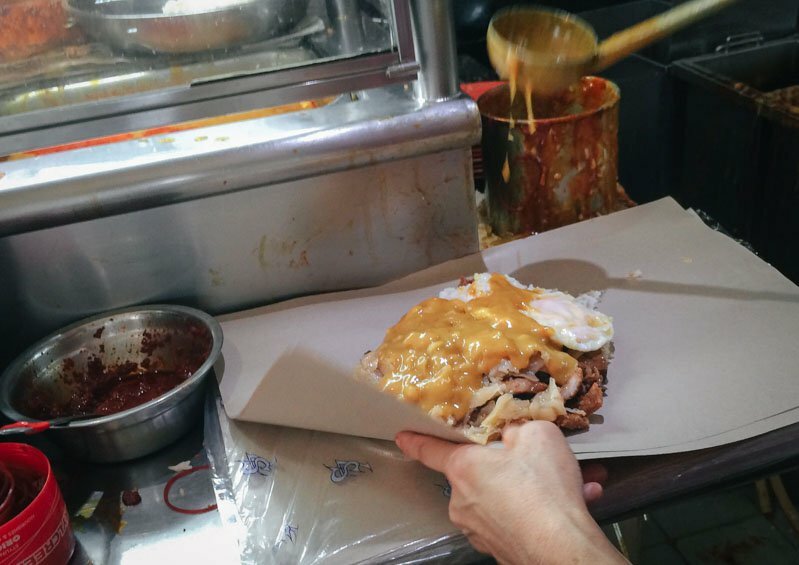 However, the focus of the dish – the curry somehow was not able to bring up the best of a Hainanese curry rice and its flavour to create a punch. 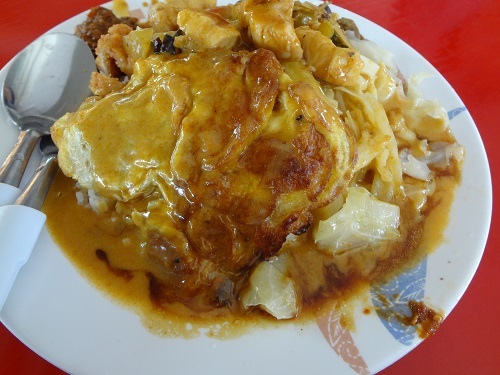 In our opinion, a real good Hainanese curry must be able to blend well with all the dishes when doused over, the curry is just important as the conductor in the orchestra, the primary duties of the conductor are to unify performers and very important in the overall performance. 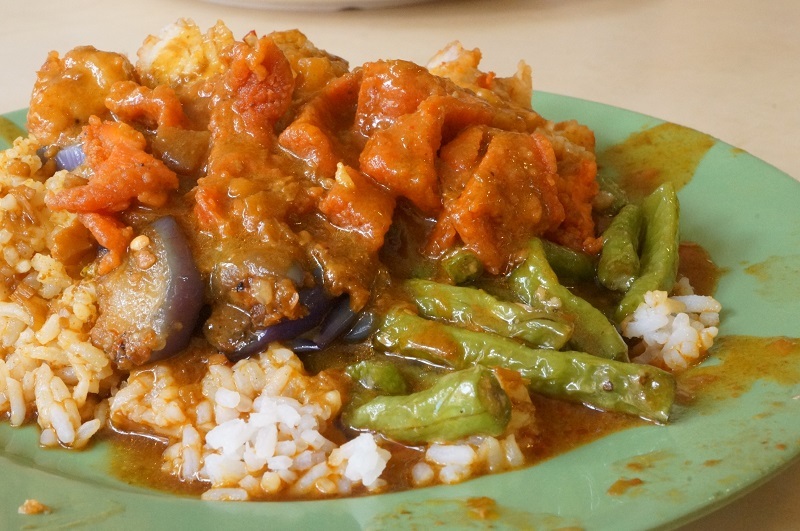 Beach Road Scissor Cut Curry Rice is raved for the succulent Hainanese curry rice in the early days and was among one of the most famous ones around for decades. Feng Kee Hainanese Curry Rice located at Pasir Panjang Food Centre serves a good tasty curry rice. 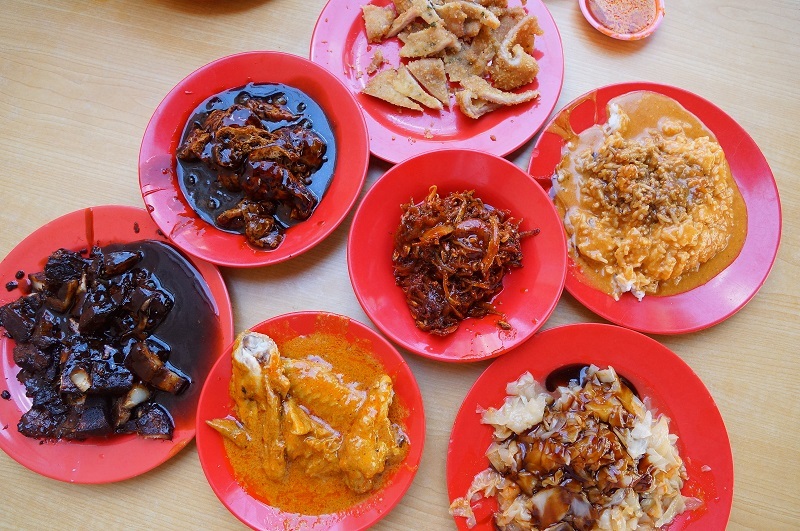 Located at Tai Kwang Huat Coffee Shop on Eng Hoon Street, Loo’s Hainanese Curry Rice is a hawker stall that offers authentic Hainanese dishes.